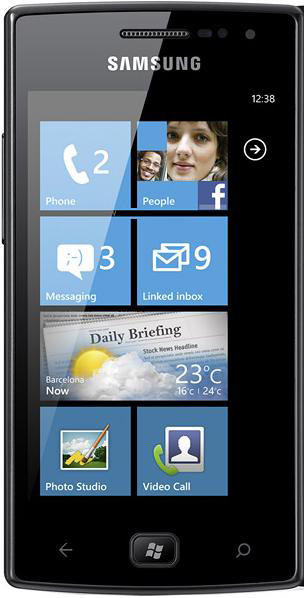 Samsung Omnia W – Windows Phone 7.5 handset Out Now! Windows 7.5 Mango handsets are being released thick and fast and the Omnia W is Samsung’s latest offering into the Windows Phone Market. The Samsung Omnia W is a well-built smartphone that features a 1.4 GHz processor to ensure the phone handles multitasking well. The device is HSDPA enabled giving fast data connection speeds to enjoy internet access and downloading content on the go and Wi-Fi is on board for use in hotspots. A 5-megapixel camera with autofocus and LED flash takes amazing shots delivering high quality images. A secondary VGA camera is present for video calls. The handset comes with 8GB of storage space that is plenty for saving photos, videos, music, games and applications. SNS integration is a must have these days and the Omnia W allows users to have quick access to their networks while the document viewer/editor is great for productivity. With a built-in music player, instant messenger, FM radio and boasting a Super AMOLED 3.7-inch touchscreen, the Omnia W is a great smartphone delivering smooth performance and functionality. The Samsung Omnia W is available to order now and we have compared the whole of the UK market to find you the best deals.